This is the third in my series of reimagining beloved Douglas Adams book covers in the Hitchhikers Guide to the Galaxy series. 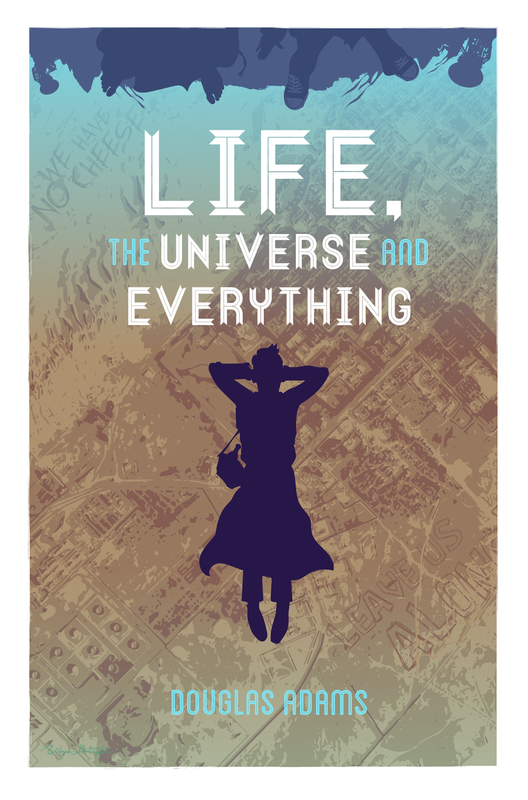 In the third instalment, Life, the Universe and Everything, we again centralise around Arthur Dent, who seems to be an unwilling observer of bizarre occurrences, which just seem to happen around him whether he likes it or not. Here, we see him in one of his rare happy moments in the stories, flying through the air above a ravaged landscape, terrorised by the flying party that pillages it for booze and snacks. We see Arthur about to collide with the flying party, and on it we can just see the feet of Ford Prefect and Slartibartfast as they cling to edge for dear life, unable to get in without a bottle. These are so well done! Have you made a cover for the fourth book, "mostly harmless"? I love your illustrations and wish I had your designs for the whole series! The original covers leave a lot to be desired ... !